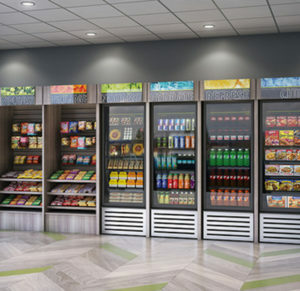 Monumental Markets is excited to offer micromarkets (also known as self-service markets, open door markets, automated markets and kiosk markets), a totally new concept in workplace vending. We love everything about this new way to vend and hope to have the opportunity to share our excitement with you. One of the main reasons for our enthusiasm is because we know that a happy employee is a better, more effective one (we have employees too!). With a Monumental micro market in Washington DC installed in your workplace providing on demand healthy food and drink, we are certain that your company will be taking a big step toward solidifying a happy staff. Our micro markets in DC allow you and your employees to have 24/7 access to hundreds of fresh, healthy choices customized to your needs. Whether your staff members are gluten free, dairy free, sugar free or have any other dietary preference, we can provide options to satisfy the most dietarily restrictive employee. Some of our clients even establish a task force populated with staff members from every level of the organizational chart when designing their micromarket. This has proven to be quite a morale booster and we have witnessed some very entertaining food related conversations among owners, managers and staff members! In addition to improved office morale is the indisputable benefit of providing healthy options: improved all around staff wellness. And, studies show that a healthy team means faster learners, fewer sick days and more efficiency across the board. As another bonus, a culture of wellness rubs off on customers too! Please call us today and let us share with you more details about Monumental Markets micro markets in Washington DC. Once you learn all the ways we can help you improve your office culture and health we are certain you will join in our excitement regarding this new concept in office vending. REACH OUT VIA EMAIL OR PHONE (301.945.7138). WE’RE ALWAYS HAPPY TO HELP!